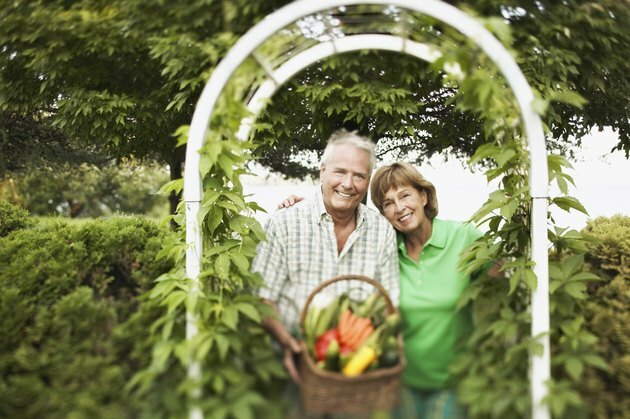 In the garden, trellises and arbors add great structure and are used to support climbing plants. 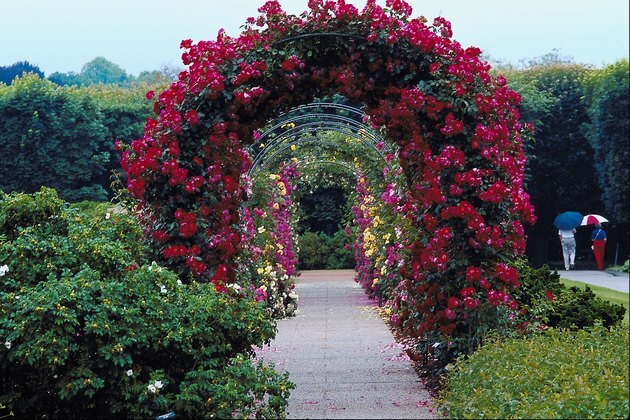 An arbor can draw the eye to a path, or frame an appealing view. Arbors should be designed to support the plants that will be growing on them. 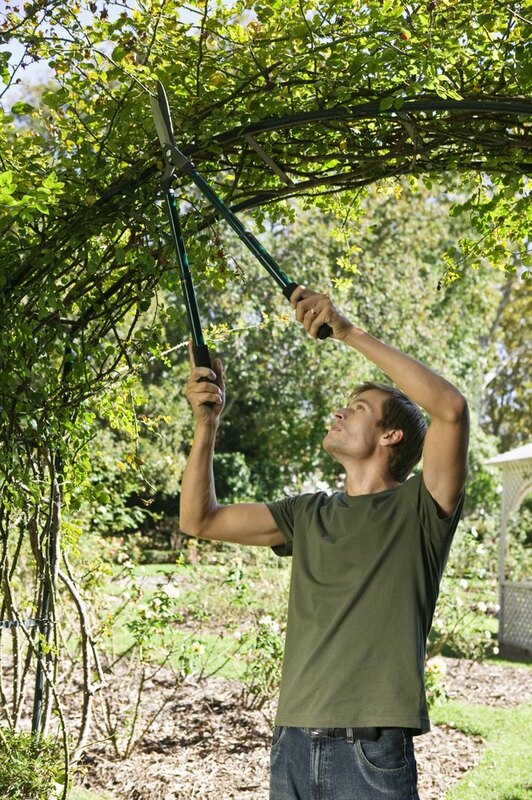 Pole beans do not need as sturdy a structure as wisteria does. Rebar is an excellent material for building arbors as it is cheap, readily available and easy to work with. Welding is not necessary for many designs, making it accessible to all. Arbors can be curved, rectangular or have a Gothic arch. 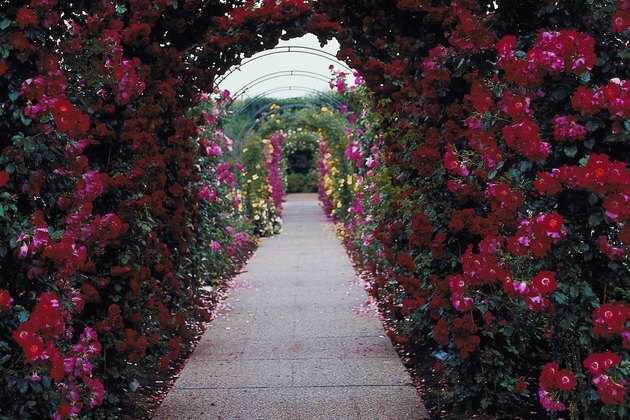 Arbors should be wide and tall enough to work and walk through with plants growing on them. Slide the 1-inch washers onto the bolt and place into the end of a two-foot pipe section. This will prevent the top of the pipe from being damaged as you pound it into the ground. Use the sledgehammer to sink the pipe at least halfway into the ground. Try to choose a day where the soil is not saturated with water or so dry as to be rock-hard. A series of arbors creates a tunnel effect. Sink the pipes into the ground in a rectangular pattern, about 8 feet wide and 3 feet deep. You can alter the design as needed for more depth. For a smaller arbor use shorter pieces of rebar. Socket one end of the rebar into the pipe, and slowly bend the rebar over to the other side, making sure the bend occurs in the center only. You can also do this with the rebar on the ground if you want more control. Two people make this step much easier. Once both pieces of rebar are in place, wire the welded wire panels in place, starting about six inches above the ground. Also known as cattle panels, they can be found at feed stores and hardware stores. Panels will only need to be wired at both ends and once in the center. Cedar Sanderson has been writing for business, marketing and creative reasons for more than 10 years. Her background in farming, parenting, computing and many other areas gives her a great deal of knowledge to draw on.